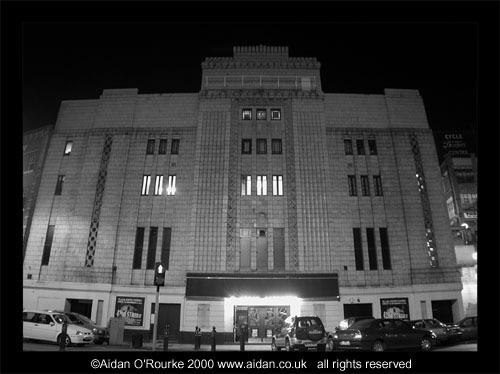 THE FUTURE OF CINEMA 1932-style at the Plaza, Stockport and 2000-style at the Printworks, plus a few other views from Manchester. THE TILED FACADE OF THE PLAZA SUPER-CINEMA became visible again in late 2000, when scaffolding was removed after the completion of renovation work. The job was completed in time for an occasion when history repeated itself: On the 30th of November 2000, an enthusiastic audience saw the film "42nd Street" - the same film shown on the opening of the cinema in 1932. Here we see the cinema at approximately 10.30pm shortly after the programme finished. THE PLAZA SUPER CINEMA, Mersey Square Stockport saw the historic return of a cinema audience on Thursday 30 November 2000, when the commemorative premiere of the film "42nd Street" took place. The supporting programme included Al Jolson tribute artist Steve King, accompanied by the Plaza Orchestra, and the organist Colin Hilton. After many years as a bingo hall, the Plaza was taken over by the Stockport Plaza Trust, who are running the cinema as a cinema and performance venue, and are helping to restore it to its original splendour. 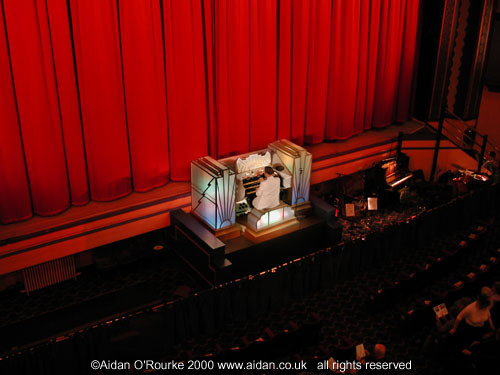 THE COMPTON CINEMA ORGAN is one of the treasures of the Plaza Super Cinema, Stockport - it's one of the few fully working cinema organs still operation in its original location anywhere in the UK. 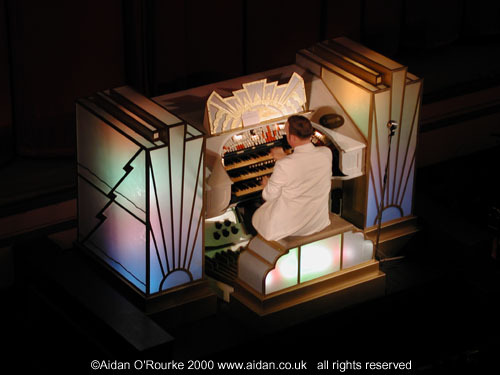 Here we see the organ being played by renowned organist Colin Hilton, on the evening of the premiere of 42nd Street, on 30 November 2000. THE STEPS NEXT TO THE PLAZA CINEMA, Mersey Square Stockport, were built in 1929, three years before the completion of the cinema itself. In the year 2000, they still look largely as they did when they were first built. 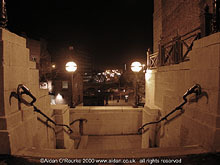 As a child I have strong memories of climbing up and down these steps, which seemed much bigger then than they do to me now. In the background we see part of Mersey Square, and in the distance, Wellington Road North. 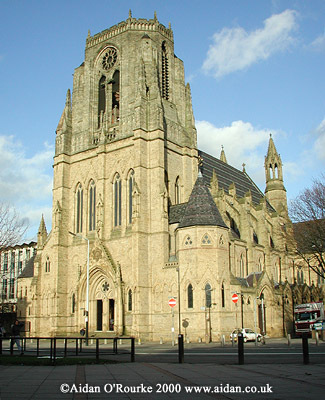 THE CHURCH OF THE HOLY NAME OF JESUS, on Oxford Road, was opened in 1871, and designed by Joseph Aloysius Hansom, famous for designing the two-wheeled 'hansom cab'. As can be seen from the difference in the colour of the stone, the octagonal shaped tower was added much later - 65 years later, in 1928. The style is 13th century gothic, similar to cathedrals in France. Every day at six o'clock, the bells of the Holy Name are rung. It's a striking piece of Victorian sacred architecture in a highly profane setting - diagonally opposite the Manchester University students union building. THE WHITE CITY GATES originally formed the grand entrance to the Botanical Gardens, opened in the late 19th century. A picture in the Central Library Local Studies collection shows the gates as they looked just over 100 years ago, covered in ornamentation which has since disappeared. When the gardens closed, the gates were incorporated into a greyhound track, and finally, a trading estate.. 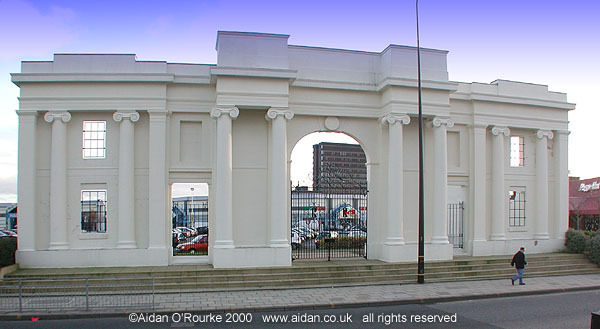 Despite their uniqueness and beauty, little is made of the White City Gates as a feature - the view of the gates from the main road is now obscured by one of the mounds built in between the slip roads of the Trafford Road roundabout. I was standing on the mound when I took this photograph - only possible by using a wide angle lens. THE VIEW FROM OLD TRAFFORD looking towards central Manchester gives quite a spectacular view of the city centre skyline. It's difficult to imagine how this spot must have looked 200 years ago, when this was open countryside, and the River Irwell was used by sailing boats. In 2000, several transport routes run parallel to each other- the Ship Canal, now no longer used by ships, the recently built Metrolink bridge, used by trams on their way to and from Eccles, the Bridgewater Canal, which runs through Trafford Park, the Manchester to Flixton and Warrington Railway line, and out of the picture to the right, the new road from Old Trafford towards the city centre. 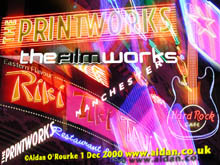 THE PRINTWORKS, opened in late Autumn 2000, is Manchester's most exciting new entertainment and leisure complex. It's housed in the former Kemsley House, once home to the Daily Mirror and the Evening Chronicle. 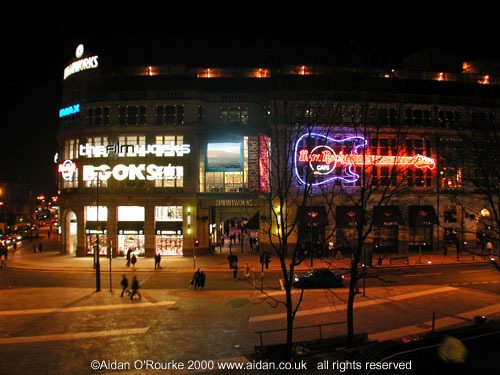 The exterior has some eye-catching light features, including the giant neon guitar of the Hard Rock Cafe, and above the main entrance, a very bright video screen showing blue skies and seas. Interesting to note that on either side of the main entrance, there are the two lanterns which originally adorned the hotel which stood on this spot before Kemsley House was constructed. THE INTERIOR OF THE PRINTWORKS is a celebration of Manchester's past, present and future, highlighting the role played by newspapers in the life of the city. Famous titles of the past, including the Evening Chronicle and the Daily Sketch, can be seen on the facades, which are recreations of the past. 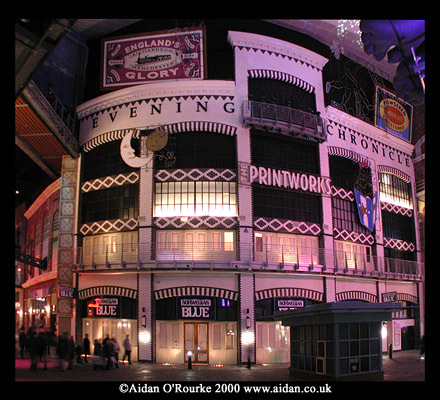 But the Printworks also looks into the future, with an amazing light and video show which is projected onto the only ceiling screen I've ever seen. There's also the Film Works cinema complex, with its state of the art projection systems. It's loud, exciting, entertaining, and futuristic in its appeal, but it's also educational in the way it recreates a sense of the old Manchester. Eyewitness says: The Printworks is the best thing to happen to city centre Manchester in a long time and I have only one criticism: It's not big enough. 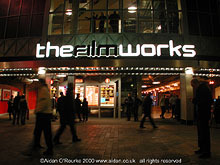 THE FILMWORKS, part of the UCI Cinema chain, offers Manchester audiences the cinema technology of tomorrow. As well as multiplex screens, some of them using digital projection, there is a giant Imax theatre showing films made in the super-size Imax format. The screen is several storeys high, and fills your field of view right out to your peripheral vision. It makes for a visually breathtaking experience, especially when the film is in stereo vision. THE PRINTWORKS main entrance was once used by horses and carts carrying newspapers out of the works and on to newspaper stalls and newsagents. Through the arched entrance can be seen the bright lights of the Marks and Spencer building, on the other side of Exchange Square. 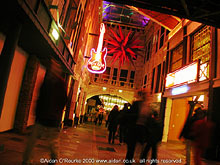 THE PRINTWORKS NEON LIGHTS add an aura of transatlantic glitz to the interior of this superb new entertainment centre. In this picture we see some of the famous names which have already taken up residence in the Printworks: The Hard Rock Cafe, the restaurant Riki Tiki Tavi and the Film Works cinema complex. In early 2001, more bars and restaurants will be opening up, adding a further buzz of excitement to this already fun-filled place. Eyewitness says: In the Printworks, Manchester has gained a fantastic new attraction which brings people a glimpse of the future, whilst recreating the best of the past. 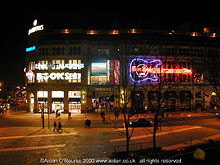 MORE PICTURES and mini-articles from Manchester city centre will be added shortly.